Here in England the very name has an accent. Saf London. Saf of the river, Mate. Alight from the Docklands Light Railway and put your x-ray history specs on, and marvel at the traces, those which remain and those which have been long cleared away. For Deptford may be Deptford, but it began as a site on an ancient Celtic trackway: where men stopped walking for a little and stayed while at the ford on the Ravensbourne river.The crossing of a river is a fine place to watch traffic go by, and fish, and receive the good things a merchant might bring from somewhere exotic and far away. The Romans saw no point in making another trackway just for the sake of it. Celtic feet gave way to Roman, and earth to a proper Roman Road; and then the road grew up to be Watling Street, one of the foremost roads in the land, a proud meander from Dubris to Magnis, or Dover to Kenchester, in Herefordshire, to you and I. “Tell, forth your tale, and do not waste the time. Here’s Deptford! And it is half way to prime. And then again, those furious Cornish men who chose to march on London trod the trackway next the Thames at Deptford. They didn’t get any further, though. It was Henry VII’s lucky day: the King was convinced of the fact. He moved on the ill-equipped, if irate, force of Cornish who were protesting at the harsh taxes they were forced to pay. He took 25,000 men nand slaughtered maybe 2000 Cornish before repairing to St Pauls to give triumphant thanks. One of the great royal dockyards grew up there, launched by Bluff King Hal: Bess knighted Drake there. Tsar Peter the Great spent three months studying shipbuilding in its Sayes Court; John Evelyn write life there. And today I have a course there: hours away by train and tube from leafy Berkshire. It will be a proper adventure. Posted in Places to visitTagged anglophile, Britain, Deptford, england, history, shipbuilding, UKBookmark the permalink. I can only hope I’ve caught you in time to wish you an amazing day, Kate. It sounds perfect. It has been most interesting, Andra 😀 Probably more investigative than usual….I need another day though! Many thanks, Beth. It has been a great day. Sarf rhymes with bath, doesn’t it, Martin? 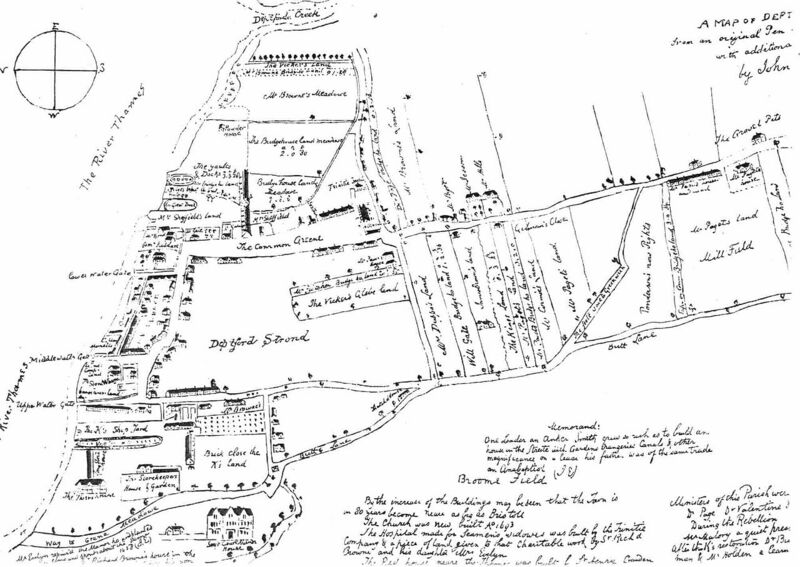 😀 It has been an off-the-wall day and I need at least two more and a series of historical maps to do Deptford justice. Have FUN on your proper adventure! Nancy, I had a blast…but I need more time! Now I’m wondering if your “proper adventure” will be one that will enter the history books, Kate? Do remember to take pictures. I didn’t make historical ripples today, Virginia, but I’m going back first chance I get. Further investigation needed. Oh, very good — I do love an adventure, more so a proper one. Rob, it has been ace. But I need more time to uncover the full story…. Cheers, Gabrielle. I had a boas. Lovely people in Deptford.